Nehemiah, the young son of a Jewish woman, a weaver from Jerusalem, is born and raised among the Jews who didn't return to Jerusalem from the Exile. Educated by Rabbi Kagba, one of the magi present at Jesus' birth thirty years earlier, Nehemiah grows up with the expectation of a soon-coming Messiah. Could the Yeshua of Nazareth, who is walking the earth, reportedly doing miracles, be that Messiah? When young Nehemiah must travel the long caravan road to Jerusalem, he is charged with an unusual mission--to carry a mysterious object back to the holy city of Jerusalem...an object whose reappearance heralds the Messiah's arrival. Nehemiah arrives in Jerusalem just as the final events of Jesus' earthly ministry are coming to a climax: the Feast of Dedication, the Triumphal Entry, the last cleansing of the Temple, and culminating at the Last Supper in the Upper Room. Only Nehemiah understands the true sacrifice that is to come as he makes the cup worthy of his Savior. 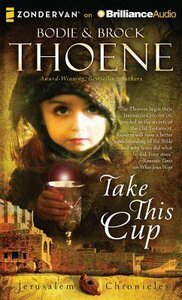 About "Take This Cup (Unabridged, 12 CDS) (#02 in The Jerusalem Chronicles Audio Series)"
Bodie and Brock Thoene (pronounced Tay-nee) have written over 45 works of historical fiction. That these best sellers have sold more than 10 million copies and won eight ECPA Gold Medallion Awards affirms what millions of readers have already discoveredthe Thoenes are not only master stylists but experts at capturing readers minds and hearts. Bodie has degrees in journalism and communications. Brock has often been described by Bodie as an essential half of this writing team. With degrees in both history and education, Brock has, in his role as researcher and story-line consultant, added the vital dimension of historical accuracy. Due to such careful research, The Zion Covenant and The Zion Chronicles series are recognized by the American Library Association, as well as Zionist libraries around the world, as classic historical novels and are used to teach history in college classrooms. Bodie and Brock have four grown children - Rachel, Jake, Luke, and Ellie - and five grandchildren. Their sons, Jake and Luke, are carrying on the Thoene family talent as the next generation of writers, and Luke produces the Thoene audiobooks. Bodie and Brock divide their time between London and Nevada.- Publisher. Bodie and Brock Thoene (pronounced Tay-nee) have written over 45 works of historical fiction. That these best sellers have sold more than 10 million copies and won eight ECPA Gold Medallion Awards affirms what millions of readers have already discovered the Thoenes are not only master stylists but experts at capturing readers minds and hearts. Bodie has degrees in journalism and communications. Brock has often been described by Bodie as an essential half of this writing team. With degrees in both history and education, Brock has, in his role as researcher and story-line consultant, added the vital dimension of historical accuracy. Due to such careful research, The Zion Covenant and The Zion Chronicles series are recognized by the American Library Association, as well as Zionist libraries around the world, as classic historical novels and are used to teach history in college classrooms. Bodie and Brock have four grown children Rachel, Jake, Luke, and Ellie and five grandchildren. Their sons, Jake and Luke, are carrying on the Thoene family talent as the next generation of writers, and Luke produces the Thoene audiobooks. Bodie and Brock divide their time between London and Nevada.- Publisher. Unavailable. Publication Cancelled Other edition is available. 9780310336037 0 Available.